Why would you choose an Aimpoint over an Eotech or an Eotech over an Aimpoint? 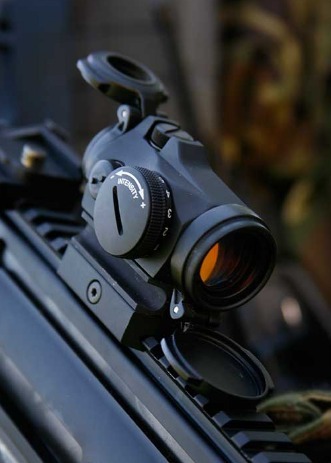 While there is a pretty much infinite range of alternatives and combinations out there, the fact remains that, for many shooters, the choice in a reflex or red dot sight comes down to Aimpoint or Eotech. This is not only due to their excellence, but their widespread adoption by military and security forces and US police departments as near de facto standards. In some ways this is similar to the situation between the Trijicon ACOG and ELCAN Specter in the magnifying sights. Now we’ll take two popular Aimpoint Models – the Aimpoint T-2 Micro and the Eotech EXPS-3. I chose the T-2 because it is the smallest, lightest Aimpoint with full night vision compatability and widespread military acceptance. It’s essentially a T-1 Micro with a much clearer red dot and better protected adjusters. The EXPS-3 Eotech has been standardised by the United States Special Operations Command (USSOCOM) and is likewise in widespread use with security forces world-wide. However, adoption as a standard military sight for infantry use has been far lower for Eotech products, presumably because of their perceived lower robustness. Off hand, the only major country I can think of that has standardised on the Eotech for infantry use is Spain on its railed version of the G36 rifle. With the G36 currently being the subject of considerable controversy and some litigation, it could be that even that role could turn out to be relatively short-lived. Robustness is hard to quantify, but a simple glance at the two systems will reveal the Eotech is more vulnerable to impacts in use. How big a deal is this? Evidently not enough to put USSOCOM off, but then they have an unlimited budget. Armies are not going to want the expense of replacing sights wrecked in training mishaps. That said, if the objective window of the Eotech is shattered, you will be able to see the reticle. Also, should the sight die completely, you can use the Eotech;s aperture as a rearsight and center the foresight in it, yielding acceptable accuracy for CQB style engagements. USSOCOM can also afford to have an offset small red dot sight on their carbines should they wish and the weapon in question almost certainly is fitted with day and night capable lasers and flip up irons. The operator in question could probably hit a man-sized target every time under ten metres quicker without using any sights at all. The 10 meter/33ft immersion depth is not that much of an issue as special forces types generally use O2 rebreathers for underwater insertion which trade simplicity and bubble-less operation for the shallow >6 metre depths imposed by O2 toxicity. If you really want to take your weapon scuba diving down to 80ft, buy an Aimpoint. The Eotech copes better with different ranges – it can come with one, two or four one MoA dots inside its 65 MoA reticle to assist with aiming off for range. 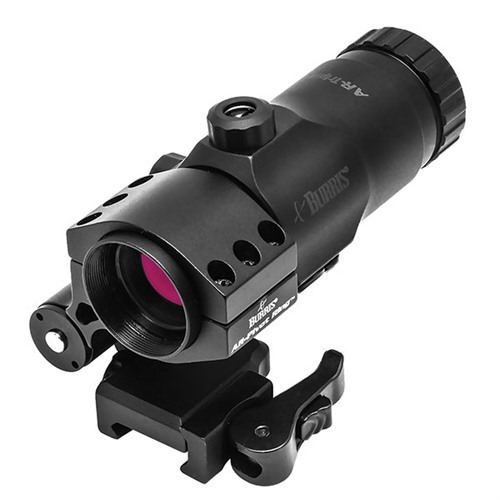 The one MoA dot is crystal clear which really helps with long distance aiming, particularly with the magnifier option. 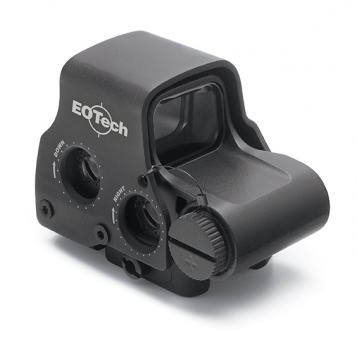 The Eotech also has a far wider range of brightness settings – a total of 30 of which 10 are night vision compatible. 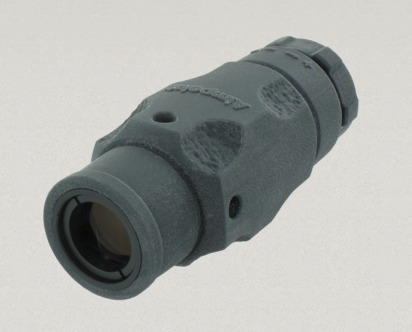 The Aimpoint Micro T-2 has 12 of which four are night vision compatible. I have never seen anyone claim this to be a problem thought, nor has it prevented widespread adoption by agencies that employ NV. Aimpoint have made great strides with the clarity of their red dot in the T-2, but it is still not quite as crystal clear as the Eotech 1 MoA dot and ring. That dot and ring system is widely accepted to result in fractionally faster target acquisition, and fractionally faster is often all it takes. Multiple dots for different ranges are another great option on the Eotech. 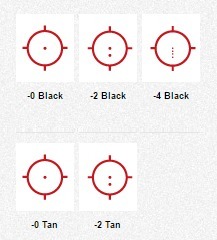 Ditto the 1 MoA dot(s) vs the 2 MoA of the Aimpoint for better accuracy on those longer range shots. You should bear in mind however that Eotech has come under criticism of its products for significant zero shift under conditions of extreme cold. You should read this press release from Eotech before considering purchasing one of their holographic sights. Both Aimpoint and Eotech offer magnifiers, but the new, shorter, Gen 3 Eotech magnifier is regarded as better in having external adjustments by some. IT comes with an integral flip to side system. The latest Gen 3 is 3.25 maginfication and comes with an easily operated QD lever. A 7mm riser is supplied to enable different co-witnessing configurations. It is available in tan or black with the flip to side mount for $549. Aimpoint have really upped their game in the magnifier department. It used to be you were stuck with a very expensive magnifier and a twist off mount that was highly inconvenient compared to the flip type on the Eotech. However, Ampoint’s glass has always been considered better than that of the Eotech G33 magnifier, albeit not dramatically so. They recently brought out two mounts that are both twist off and flip to side in high and low respectively. Before this you had to buy an aftermarket mount – the Samson flip to side mount or Larue flip to side mount for example. 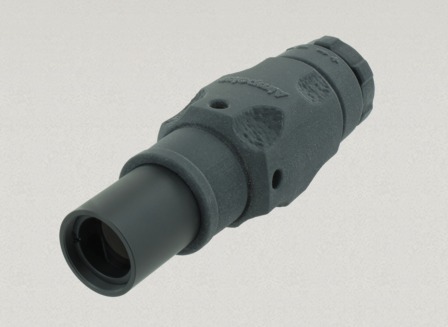 They can also be used with other 30mm magnifiers and cost $325 each from Brownells. 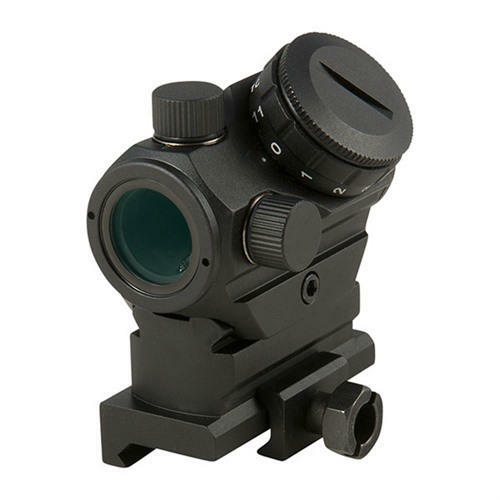 They recently introduced an Aimpoint 3x-C commercial 3x magnifier an Aimpoint professional 3XMag-1 magnifier and the Aimpoint professional 6xMag-1 magnifier for $276, £632 and $816 respectively. If you already have the twist off base you can buy a flip to side replacement top assembly for it. The dioptre focus adjustment on the Aimpoints is great too – +2 to -2 on the Commercial and +3 to -3 on the Military. 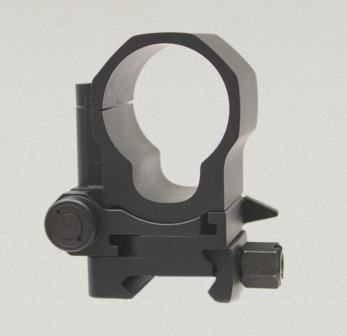 You will have to use a tool to optically center the Aimpoint. The bottom line is that a 3x professional Aimpoint magnifier with the latest flip to side and twist off mount will set you back $977. That is still a lot of notes for a unit that is somewhat better. When it comes to weight, the Aimpoint 3x Magnifier weighs 8.1 oz and the flip mounts 4.0oz or 4.6 oz depending on 30 or 39mm axis above bore for a total of 12.1 or 12.7 ounces. Remember with the Aimpoint this includes a tough rubber cover. The corresponding figures for the Eotech are 6.1oz and 2.9oz for a total of 9 ounces. This won’t matter much to a competitive shooter or hobbyist, but when you are (as per the oft quoted example) in the field cutting your toothbrush handle down to save weight, it is a factor to take into consideration. If we take the weight of the sights into consideration, the Aimpoint T-2 with LRP quick detach 39mm riser equipped mount for co-witnessing on the AR platform is 4.9 ounces. The EXPS-3 is 11.2 ounces. This gives us a total system weight of 17.6 ounces for the Aimpoint T-2 and 20.2 ounces for the Eotech EXPS-3, both with their own proprietary magnifiers. Whether battery life is a consideration or not depends on your intended usage. Special forces, hunters or competitive shooters can expect to have their rifles used over relatively short periods of time. Infantry, the police on patrol, farmers and preppers need something that they know will work instantly when they grab it at anytime, over months if not years. There is simply no comparison between the battery lives of the two units. 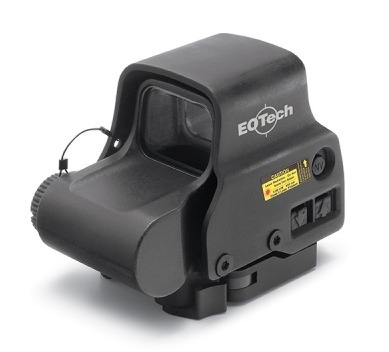 The Eotech can achieve 600 hours on setting 12 on its single CR123 lithium battery. The 5 series models can achieve substantially more – up to 1000 on a pair of AA lithiums. This compares to 70,000 for the Aimpoint Micro T-2. You can literally leave your Aimpoint switched on for 50,000 hours at a daylight setting. That’s over five and a half years on one CR2032 battery. Energiser claim that their CR2032 has an 8 year shelf life, so you could pop one in a storage compartment in your pistol grip and potentially have over 11 years use right there on the weapon. 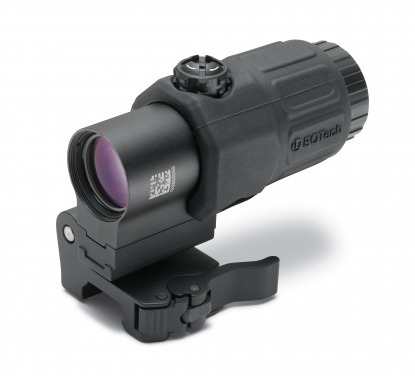 New Eotech G33 3.5x magnifier, flip to side mount and spacer. If cost is an issue and you don’t need to be at the bleeding edge of quality, it might even be better at looking at a Vortex Arms magnifier instead. Now we come to versatility. The Eotech is relatively bulky even with its transverse battery mounting. You are not going to want it anyplace other than on top of the weapon, whereas you can use a T-2 as an expensive but rugged and reliable offset back-up sight – perhaps for an Eotech and magnifier rig or for a 1-4×20 scope. So to recap, which category do you fall into? 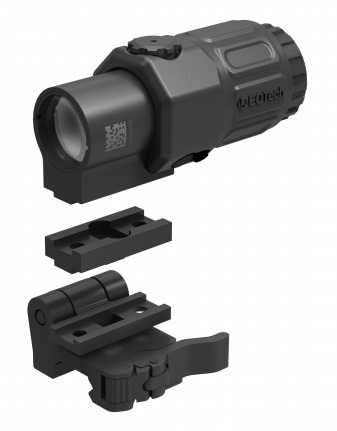 Posted in Aimpoint, Eotech, Sights - Reflex | Comments Off on Aimpoint or Eotech? 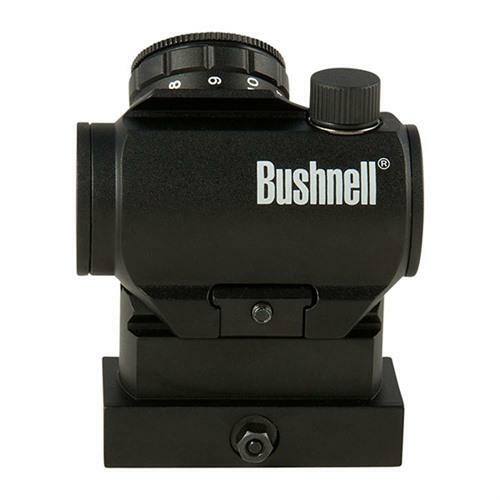 The Bushnell TRS-25 has won a lot of acclaim as an alternative to the Aimpoint T-1, H-1, T-2 and H-2 series even in professional circles. It costs a fraction of any of the above and is highly robust, only really giving up Night Vision compatibility and battery life, although it is claimed to get 3,000 hours out of a single CR2032 battery. Adjustments are similar to the Aimpoint with no less than 11 brightness settings. The detents for these are very strong. The glass is very clear even at night and unlimited eye relief makes it suitable for handgun use. Lens covers are supplied, but are not connected to the sight when removed and could be easily lost. The adjusters are sealed with O-rings as is standard these days and the sight is fogproof and shockproof up to .50BMG caliber. 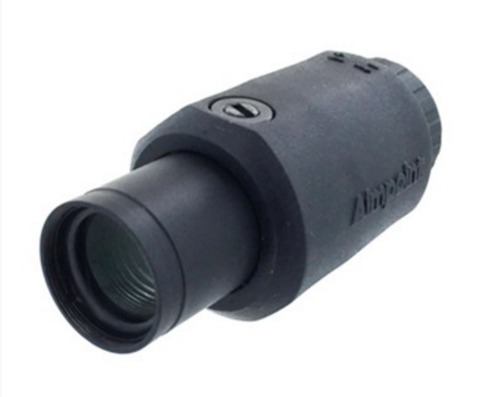 It is rated waterproof although not to the insane depth the Aimpoint T series are rated to. Construction is the usual aircraft grade aluminum. The TRS-25 reflex sight is supplied with or without a high rise mount for the Weaver/Picatinny mounting system, but, for absolute co-witness on an AR you are better off adding a UTG MAD-0340 20mm riser mount which is quick detachable with adjustable tension. These sell for around $11-00 so won’t break the bank. The red dot is 3 MoA which is a good compromise between precision for distance work and fast acquisition for close range shooting. The sight weighs in at 3.7 ounces without the high-rise mount and 6 ounces with it. Without doubt the TRS-25 is one of the best if not THE best red dot sight available in the sub $200 range. It comes with a two year manufacturer’s warranty, plus Brownells’ no-quibble complete satisfaction guarantee. 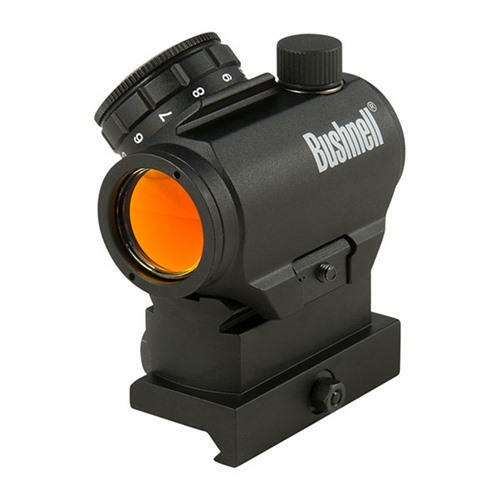 Source a Bushnell TRS-25 red dot from Brownells, a name you can trust. 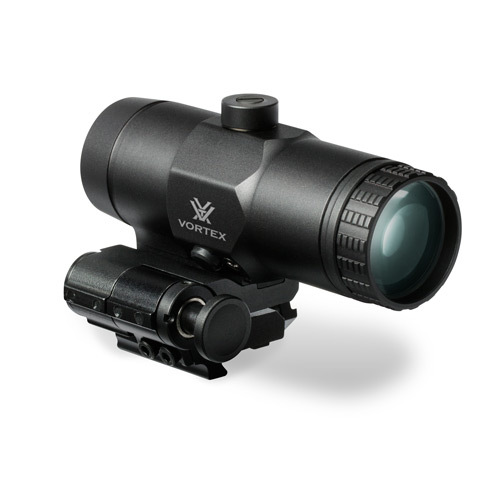 Vortex have taken the opportunity to improve their 3x magnifier with the VMX-3T version. 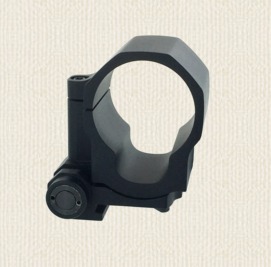 The Vortex VMX-3T magnifier comes with a spacer shim allowing both absolute and lower 1/3 cowitness on the AR platform. There are two adjuster knobs on the Vortex 3x magnifier enabling you to center the dot in the magnifier and a focus ring at the rear of the tube. It works perfectly with all the main Vortex, Eotech and Aimpoint models. 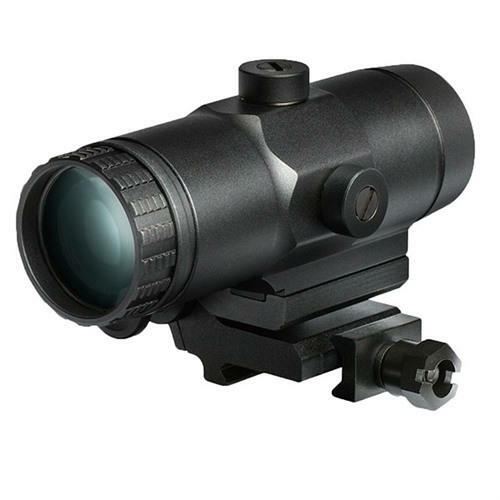 Users are reporting that this unit has clearer, brighter optics and better eye-relief than the Eotech flip to side magnifier for less than half the price. However the mount flips to the left which can annoy some users. The flip mechanism, like that of the Burris is not spring-loaded and you cannot just reverse the mechanism as it will end up with the release button at the front of the unit. Vortex have an absolute no quibble guarantee – if your site is defective or damaged in any way, Vortex will replace it, no matter what the cause. 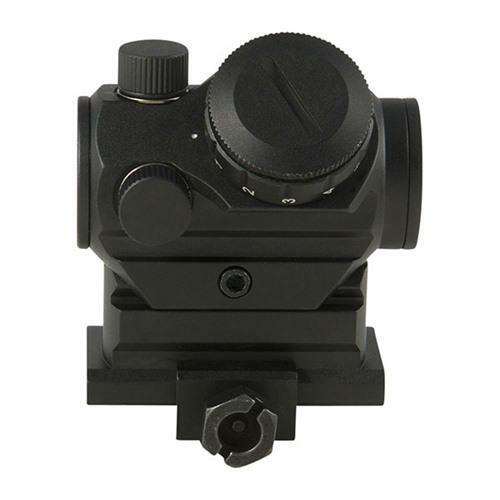 Purchase a Vortex VMX-3T magnifier from Brownells, a name you can trust! Vortex have made a name for themselves making affordable, but still good enough for defensive applications alternatives to the big ticket red dot sights from Eotech and Aimpoint. The Vortex Strikefire 2 replaces the original Vortex Strikefire with some significant improvements. The new Strikefire II red dot comes in two versions. The difference is that one has a bright red 4 MoA dot and the other a choice between red and green 4 MoA dots. With the bright red dot option you get the choice of a low Picatinny mount for rifles with lower stock configurations like the Sig and AK which functions as an absolute cowitness mount on the AR and a cantilever AR mount that gets the sight well forward without mounting forward of the upper receiver. This allows for mounting of a flip up backsight and magnifier all on the receiver. The height is set up for lower 1:3 co-witness. 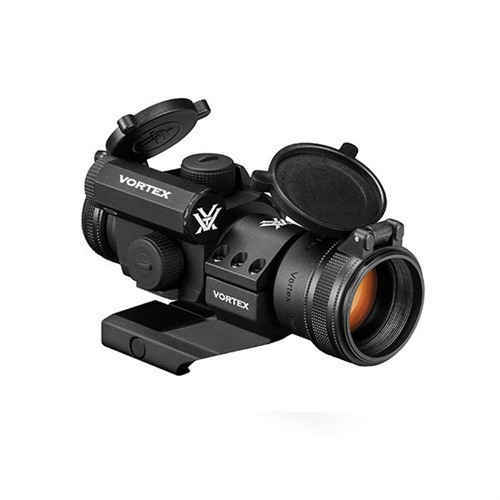 The Vortex Strikefire 2 has its windage and elevation controls shielded from impact and the brightness controls are thoughtfully located at the back of the sight for accessibility. The sight is an immensely strong 30mm aluminum tube. It is 5.6” long and weighs 7.2 ounces. It comes with lens cap covers. The optic remembers you last brightness setting when you switch it back on. Power comes from a single CR2 battery. The Strikefire 2 is waterproof and fog-proof and comes with an unlimited lifetime VIP warranty for free replacement if defective or damaged, no matter what the cause! At this price point you are getting a very good product for your dollar. You may find this video interesting.